Terrie grew up as a Navy brat where every other duty station was Naval Air Station Memphis, Tennessee. Growing up in Navy life, Terrie had the opportunity to live on Okinawa and to travel the Pacific Rim in addition to countless other countries and cities. Terrie believes her experience as the child of a Naval officer contributed greatly her to her ability to adapt to new environments and new situations. She also believes that she became an extrovert as a result of all the moves that her family made in her childhood. In other words, Terrie never meets a stranger. Terrie and her family are frequent volunteers at Grace Bridge and active members of their church and the Baptist Student Ministry at the University of North Texas. She often volunteers in the children’s ministry to get her “baby” fix now that her son is grown. Terrie is regularly seen about town with her “furry daughter” Pepper, who is a red Doberman pinscher who has a personality that is as big as Texas. Pepper, like her mommy, has never met a stranger. This did become a problem when Pepper slipped away from a family friend that was watching her while Terrie and her family were away for a few days. Pepper re-homed herself with another local family until she was finally reunited with her very frantic real family. Terrie has worn many hats in her life, from travel agent, Realtor, financial advisor, to stocks, options and commodities trader and trainer, but it wasn’t until she began a career in the law did she discover her real passion of Estate Planning. Terrie is a born problem solver, which she got to practice in her past endeavors, but it was Estate Planning that allowed her to help families plan for the future and help implement creative ways to make sure families are covered for all of life’s unexpected. Terrie is a CORE Registered Paralegal and a Certified Paralegal. 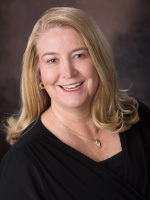 Terrie is among 3,242 paralegals in the State of Texas and 18,148 paralegals nationwide to have successfully completed the Certified Paralegal examination. She is an active member of the State Bar of Texas, Paralegal Division and DAPA (Dallas Area Paralegal Association). She also serves on the Paralegal Advisory Committee of Collin College’s Paralegal Program.